KT Tunstall chooses to live and create in the moment. This impulsivity courses through her catalog and performances, defining classics like the GRAMMY Award®-nominated ‘Black Horse & The Cherry Tree’, ‘Suddenly I See’, ‘Hold On’, ‘Saving My Face’, and many more. This urgency also drives the Scotland-born and now Los Angeles-based songstress’ recent fifth full-length studio album KIN – released in September 2016. Fueled by a heavy audio diet of Fleetwood Mac, Tom Petty, and more recent artists such as Tame Impala and Devendra Banhart, windswept Californian psychedelica and widescreen coastal pop melodies found their way into her own repertoire. Following this West Coast muse, KT embarked on a series of writing retreats to Joshua Tree and New Mexico. Returning to Los Angeles, she teamed up with powerhouse producer Tony Hoffer [Beck, Air, The Kooks] to carve out and create what she feels is her best and most visceral work to date. Simultaneously, she also drew on her recent experience studying film score composition at the Sundance Film Institute Composers Lab at Skywalker Ranch in Northern California. It’s a blossoming that began with her outstanding breakout 2004 debut, ‘Eye to the Telescope’, carried through the RIAA goldcertified ‘Drastic Fantastic’, to 2010’s unanimously acclaimed ‘Tiger Suit’, and most recently, the similarly excellently-received ‘Invisible Empire//Crescent Moon’. She won a BRIT Award, an Ivor Novello, and received GRAMMY Award® and Mercury Prize nominations. Her music has featured prominently in film and television including ‘The Devil Wears Prada’, ‘Ugly Betty’, and ‘Grey’s Anatomy’. She has penned songs for films such as Disney’s ‘Million Dollar Arm’ – co-writing with the legendary AR Rahman, ‘Winter’s Tale’ for Warner Brothers, and the soon-to-be-released, highly anticipated movie, ‘About Ray’. Now, KT begins the brightest phase of her journey yet. 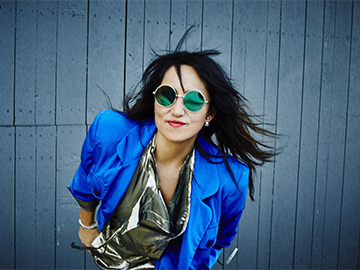 KT Tunstall updated their profile picture.